The Maze of Fangs is the very heart of the Darkbriar, a twisting labyrinth of thorns, leading to the Enshrouded Towers at the heart. Here is where Zagralath dwells, and if he ever leaves his home – or even if he can – is something of a mystery. He has never been known to visit other planes in person, though he will sometimes send servants on such errands. He has sealed his domain as tightly as he can, with no direct routes other than those portals he personally opens and closes. The only other way in is via the Overgrowth, an often difficult journey. Even those passages end far, far, from the Enshrouded Towers, leaving visitors to wend their way through the myriad passages, tunnels, and dead-ends of the Maze. Read on for the venom-dripping details! One might expect this name to be applied to some layer rich in spiders or serpents, but as with the other layers of the Darkbriar, the dominant feature of this plane is plants — plants whose thorns excrete every toxin known. Everything in the Maze, right up to the gates of the Enshrouded Towers, is coated with virulent and ever-renewing poison. There are toxins of sleep and of agony, of instant death and eternal mindlessness, venoms which can make a man wish to tear out his eyes and seeping oils which numb a man to all pain… and all pleasure. The Maze is a brilliantly colored place, as well, with tens of thousands of species of unnamable flowers, blossoming constantly, in every hue and shade… but all of them are wrong. Too bright, too rich, too deep, the initial feeling of unexpected beauty quickly fades as the visual cacophany continues to smash against the senses. The patterns of the flowers seem to speak of strange obscenities and twisting images, the colors blend and clash in ways that lead first to fascination, then to madness, and the shapes of the petals quickly reveal themselves as grim and morbid mockeries. The nature of the Maze is such that knowing its full extents is impossible. It cannot be flown over; any attempt to leave the ground results in a lashing assault; see below. The Maze is constantly patrolled and "pruned". Zagraleth was originally a gardener, and he has a constant flow of new ideas and things he wishes done, now that he is commander of his own domain. He is, of course, a notoriously chaotic taskmaster, and it is very difficult to tell what will please him and what will not, as his moods change constantly and even total obedience to his commands will not negate his wrath, if he has changed his mind in the intervening time. In addition to those who roam the maze freely, there are those set to running in it. Zagraleth will sometimes promise rewards — freedom, treasure, a position of authority in his realm — to those who can complete some task, such as reaching a particular point in the maze or finding one specific flower within a short period of time. Naturally, the games are always rigged, but, sometimes, someone will "win" — and Zagraleth may honor his promise, or he may decide the person is a threat and kill them out of hand. Demons. What can you do? The extraordinary profusion of life in the Maze of Fangs is what draws visitors to it — the most exotic poisons can be found here, things which do not exist anywhere else in the known universe. It is said that somewhere in the maze there are venoms which can kill a god. Immediate Reaction; Trigger: use of Flight, Burrow, or Climb speeds. Attack +30 vs. Fortitude, 4d10+10 poison damage plus 15 ongoing poison damage (save ends). Special: There are no limits to how many times the Maze may use this reaction in a round. Immediate Reaction; Trigger: Anyone sits on the Throne. Secondary Attack: 37 vs. Will; lose a healing surge. It is not possible for someone sitting on the Throne to remove himself, unless he has somehow learned the word of command. (This cannot be learned merely by listening to Zagraleth, as the word is at least partially mental — you must not only speak it, you must think a different phrase as you do so.) Removing someone from the Throne involves a Grapple check against the Throne’s Fortitude Defense of 42. The Throne cannot be damaged by any means. Anyone pulled from the Throne will take ongoing 15 damage (save at -2 ends). 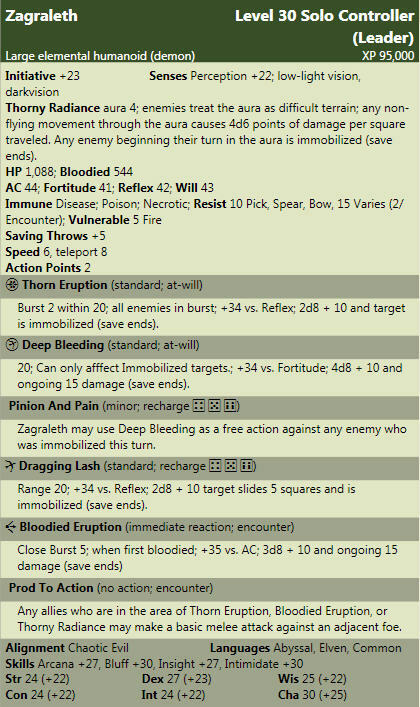 Zagraleth will be seemingly impaled when he sits on the Throne; however, he takes no real damage and can release himself as a minor action.